AverageBro: Kings of Comedy: The Republican Presidential Candidate Field of 2012. 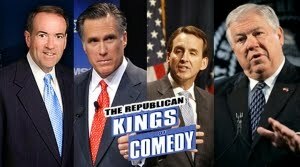 Kings of Comedy: The Republican Presidential Candidate Field of 2012. After a brief hiatus, I've got a new piece over at TheLoop21 today about the prospects for 2012. Go have a look and leave some comments.